Larson Electronics, an industrial lighting company, has announced the release of a 12 watt explosion proof mini LED work light equipped with a 100 foot cord with an inline transformer for low voltage operation. 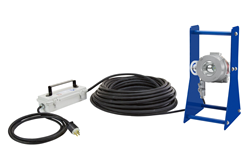 This new unit is ideal for tank cleaning inspections and other tedious work tasks that require on-the-spot lighting. The EXHL-PM-LE1-XLV-100 mini explosion proof light from Larson Electronics produces 1,320 lumens of high-intensity light for illuminating within hazardous areas and potentially explosive work environments. This unit is Class 1 Division 1 rated and includes 100 feet of cord with an inline transformer for low voltage operation. Ten feet of chemical and abrasion resistant cord protrudes from one side of the transformer and is terminated in an optional cord cap for connection to common outlets. While the light itself is classified as explosion proof, the transformer and plug is not and should be used outside of the explosion proof work area. This unit includes 100 feet of chemical resistant cord to allow substantial maneuverability throughout a work area. This portable task light is rated NEMA Type 3, 4, 4X, 7 (B, C, D) and 9 (E, F, G) and designed to withstand the rigors of demanding environmental and operating conditions. This unit can operate in temperatures of -40° Celsius to 60° Celsius, is waterproof to three meters, and resists ingress of dust, dirt, and humidity. The explosion proof LED light fixture is comprised of a nine inch round LED light head mounted within a portable base stand fabricated from non-sparking aluminum with a convenient carrying handle built into the top of the stand. The aluminum A-frame is powder coated with a glossy blue finish for corrosion resistance. The lamp can be easily adjusted up and down 90° and locked into position by loosening the two hand screws located on either side of the light head.